This book came to me by way of a recommendation from a book club member who also reads mysteries and series. I have read Nordic Noir authors Jo Nesbo, Steig Larsson, and Henning Mankell, but I had not read any books from the Department Q Series by the Danish author Jussi Adler-Olsen. All of the authors have a reputation for their dark descriptions of crime, twisted plots, and grizzled detectives. This book follows a popular recipe for sleuths: troubled personal relationships, inability to get along with co-workers, abuser of substances, and a brilliant deductive mind. 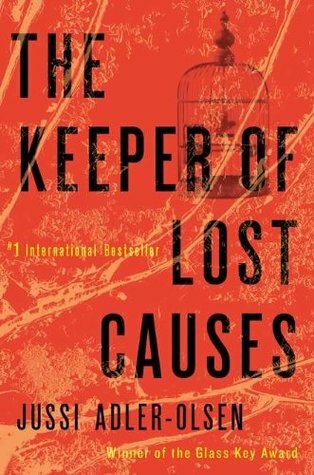 The plot goes back and forth between the last week Detective Carl Mørck was a homicide detective and the present, when he is assigned to lead a newly created Department Q – a literal closet in the basement of the police department where the most difficult cold cases reside. Thinking this is a promotion, Carl soon realizes this position will take him out of action. The first case he selects from boxes and boxes of cold cases involves trying to find a missing politician captured five years ago and assumed by many to be dead. Carl is assigned a staff of one – a man with a mysterious past named Hafez el-Assad. Initially Carl views Assad as not much more than a driver and personal assistant, but Assad makes himself a real partner in solving cases and becomes invaluable to the department. At home, Carl is separated from his wife Vigga, is a sometimes guardian to his stepson, and is in need of the rent that is paid by his opera-loving lodger to make ends meet. This book will take you on a ride that is sinister and horrifying. Expect that with Nordic Noir. For those who have Amazon Prime, the first three books in the Department Q series are also films in Danish with subtitles. I found the casting to be spot on and the Danish countryside both beautiful and foreboding. 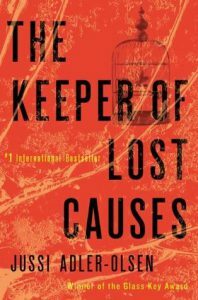 Adler-Olsen, Jussi, The Keeper of Lost Causes: The First Department Q Novel. New York: Dutton, 2011. This entry was posted in Books & Reading and tagged #FridayReads, Friday Reads. Bookmark the permalink.